Backed by a team of experienced professionals, we are manufacturing, exporting and supplying an extensive array of Stainless Steel Bathroom Set. It is used to install in bathrooms. This is manufactured with utmost precision under the supervision of experienced and skilled professionals using optimum quality raw materials. We offers Bath Sets Glacier to our clients. This luxurious bath set is made up of quality material. 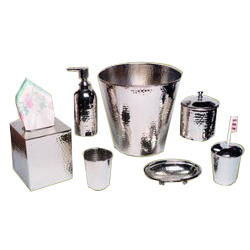 In order to retain our goodwill in this industry, we are providing a latest array of SS Bathroom Set. the elegant designs and fine finish are some of the noteworthy features of our stainless steel bathroom set. The use of optimum quality steel in the manufacturing of our bathroom set ensures high durability, resistance to rust and low maintenance cost. 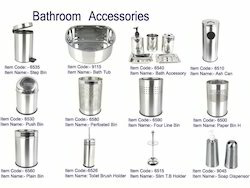 In order to retain a remarkable position in this industry, we are providing a wide array of Stainless Steel Bathroom Accessory Set.